FLEXIBLE AND DURABLE GREAT WEARING EXPERIENCE - Our polarized sunglasses not only have the fashionable style but also have the Humanized Design. Elasticity frame and Silicone nose pad give you different wearing feelings. 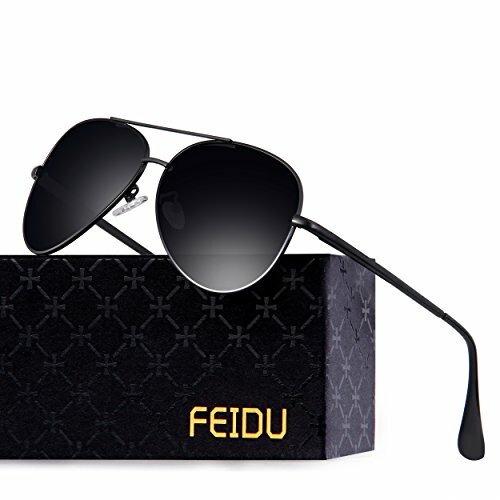 STURDY MATERIAL,GRATE WEARING EXPERIENCE- Polarized sunglasses is made of high quality metal materials that is durable enough for long time using .Metal frame more solid, more impact resistance. BEAUTIFUL PACKAGE - On the package, we put a soft case ,cleaning cloth and small screwdriver with both plain and cross head tips for many adjustments if needed in the future. The screwdriver and polarizing card can also help you know more about the sunglasses. TAC POLARIZED LENS- 100% UV400 protection coating, blocks 100% harmful UVA & UVB Rays. Purchase from WSUK with confidence that the sunglasses you receive are fully CE certified . LIFE TIME GUARANTEE ON AMAZON-30-Day Money Back Guarantee. 24-hour customer services before purchase and after sales.